J.K. Rowling better watch out! Stephenie Meyer's (ever so popular) Twilight Series is sweeping the nation and ranking high on many charts. Hundreds of thousands young teens and adults have come to crave her exhilarating vampire romance novels. Millions of copies of Twilight, New Moon, Eclipse, and The Host have been sold and have proved to be VERY successful. Stephenie Meyer's continued career will be greeted by adoring and anxious fans, which allows for her to lead an even more accomplished life. 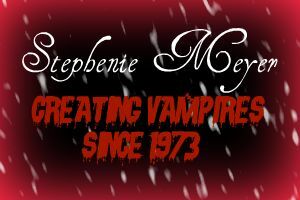 These are all links leading to pages about Stephenie Meyer...take a look! !